A friend is almost a year ahead of us in the renovation journey. Journey is her word. She’s been at this way longer than us, which makes sense given the (huge) scope of her project. But her identification of journeys seems to have some universality. She has named the design journey, the finance journey, the downsize journey and the journey of the build. There may be more as they are revealed to her. I’m sitting at the foot of her throne of wisdom, waiting for her to drop more knowledge. Yesterday, we did our finance journey. Or, at least, a major part. 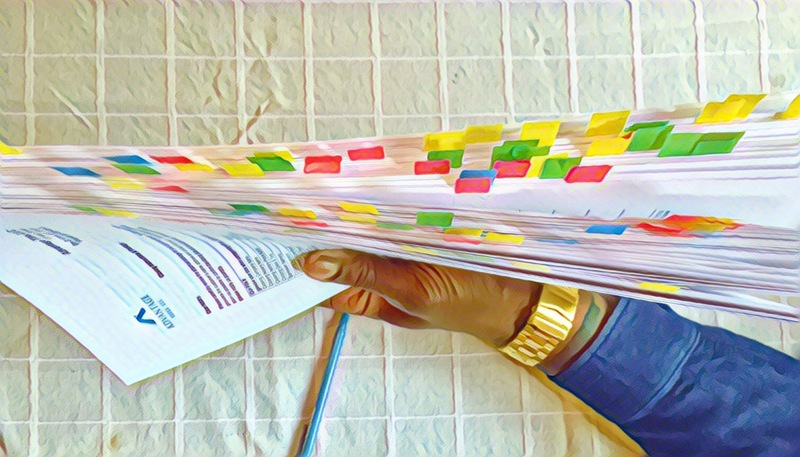 We had one-hundred and seventy eight pages of forms and contracts and acknowledgements and clauses and hold harmlesses and a smattering of goofiness that all needed to be signed. So, today, I will tell you some of the things we agreed to. We won’t run a meth lab on the property. We won’t do any nuclear energy experiments, either. We will buy insurance to protect against fire. And locusts. And fire hail. We didn’t need flood insurance, so no protection against a river of blood. We will show how we would sign our names with and without middle initials. I wouldn’t demonstrate how I would sign my name misspelled. Seemed counter-productive. We initialed four different documents that said we saw four different credit reports. Each of us did that. That was sixteen of the pages. We gave our lender permission to ask the IRS information about us that we already provided to them from the IRS. We did that a second time, too, but this time as a married couple. So there was a total of three forms saying the same thing to the IRS about information that was already in the file. We said we were not terrorists. And this is true because we signed a form with our drivers license numbers. We signed a paper saying we were married. I did laugh out loud for that one, especially since the Spouse refused to acknowledge our relationship on Facebook for years. We put our initials on a bunch of pages. The Spouse dogged me for missing one. The notary found one the Spouse missed and let me pay his snark back. I liked that guy. There were many more pages and affirmations and agreements and promises in the finance journey. Yet it is all simply the prelude to the writing of the checks. Now, signing those lines feel like the real Odyssey. Next journey, up. I hope we didn’t piss off Poseidon.